"These are not the supernovae you are looking for." When the Frontier Fields program began, I thought I knew what the most interesting transient science would be. I was very wrong. With over 1200 hours of Hubble Space Telescope (HST) observations over a span of about three years, the Hubble Frontier Fields (HFF) program was an exciting opportunity for supernova (SN) science. The Frontier Field clusters act as gravitational lenses, magnifying background sources that are otherwise too faint to be seen, even with HST. 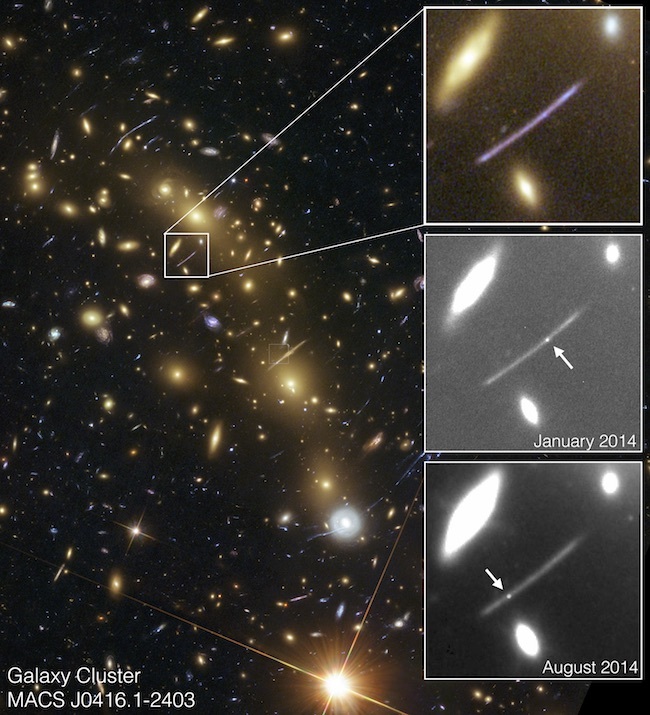 I figured this was a unique chance to use this gravitational lensing to find very distant SN, and to use background SN to learn about dark matter in the foreground clusters. As I was organizing the FrontierSN team to search for those SN in the HFF data, the Grism Lens-Amplified Survey from Space (GLASS), led by Tommaso Treu at UCLA, was also planning to search for stellar explosions in and behind these galaxy clusters. The GLASS team's supernova specialist was Pat Kelly, then at UC Berkeley, and now at the University of Minnesota. We struck up a collaboration, and agreed to work together to jointly analyze any interesting supernovae or other transients we might find. 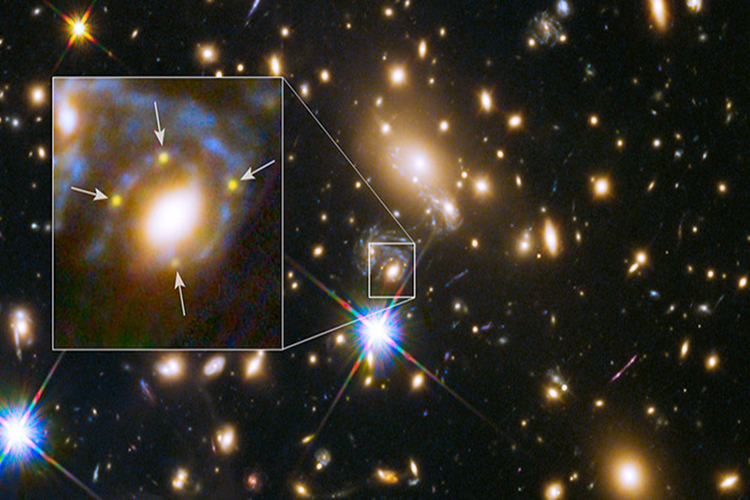 Our first unexpected discovery came in 2014, less than a year into the program, when we found what appeared to be two separate images of a single stellar explosion of some kind…but it was clearly not a supernova. The transient source (which we nicknamed “Spock”) appeared twice in the same strongly-lensed galaxy. Too fast and faint to be a supernova but too bright to be a nova, both of the Spock events appear to be unlike almost any other category of known transient phenomena. In the April 2018 issue of Nature Astronomy we present several good stories that might explain the Spock events, but with the limited data available we can't say for certain exactly what we saw. While we were still puzzling over the Spock events, Pat Kelly made the second big discovery in the Frontier Fields: the multiply-imaged SN Refsdal. The first of its kind, SN Refsdal broke open the field of gravitationally lensed SN studies in a spectacular way. This SN appeared with four distinct images all at once (an “Einstein cross” configuration), each one magnified by as much as a factor of 20, and then showed a fifth image about a year later. While we were still watching SN Refsdal slowly fade, a new and unexpected transient appeared. 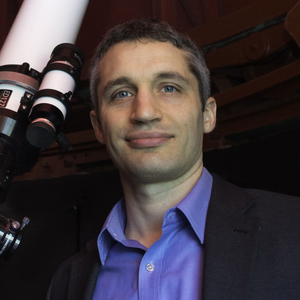 This "Icarus" is the most distant star yet observed. Even after all of that, the Frontier Fields were not done surprising us. While we were continuing to monitor the remarkable and long-lived SN Refsdal, we found yet another unusual transient, officially designated MACSJ1149-LS1. Once again, this was not a SN. Unlike the Spock events, however, this one hung around long enough for us to get much more useful data, and has a more satisfying explanation. It is still a highly unusual transient, caused by a complex series of microlensing events that magnified a single blue supergiant star at z=1.5. Nicknamed “Icarus" after the mythological boy who flew too close to the sun, this was a star whose light came too close to the dark heart of the galaxy cluster, and was briefly magnified into our view. These last few years have been an exciting time for discoveries of gravitationally lensed transients—but they are just not at all the kind of transients that any of us had set out to find.